First of all, I am not a super fan of Pork. Because if I have to choose between Chicken or Red Meat, I would mostly pick Chicken over Beef or Pork. You know, Chicken is way healthier than those 2 meats. But well, I couldn't resist Ribs especially Pork Ribs because it is more tender (usually) than beef ribs. 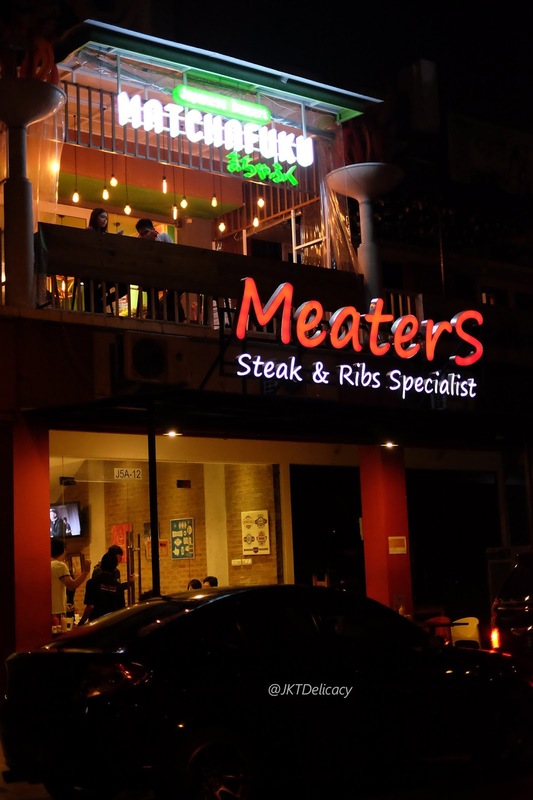 And this MEATERS offers you one of the most affordable Steak and Ribs anywhere in the city, and I mean proper Steak and Ribs. Not the small and short cut ribs from a local indonesian restaurants. 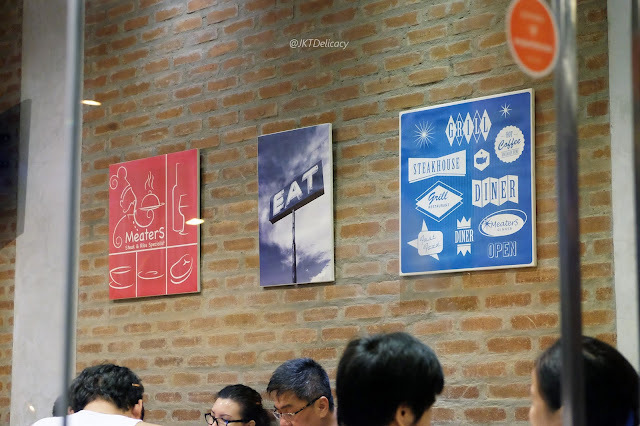 To be honest, I've never been visiting Citra Garden Area, nor even know where it is located, until many new cafes and coffee shops being explored by food bloggers in Instagram. 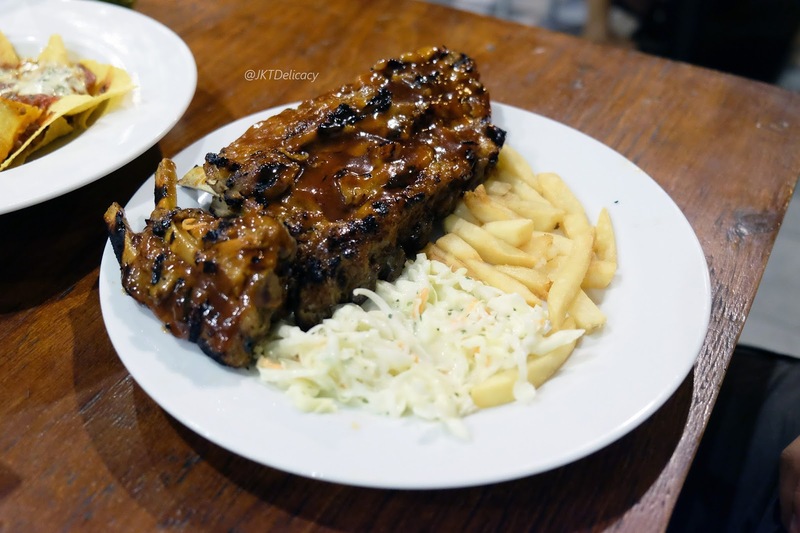 And so, last week I visited there 2 days in a row (19 & 20 July 2015) just to taste this Steak and Ribs. Not much that I can post from the interior because it's fully packed of customers when I came there. 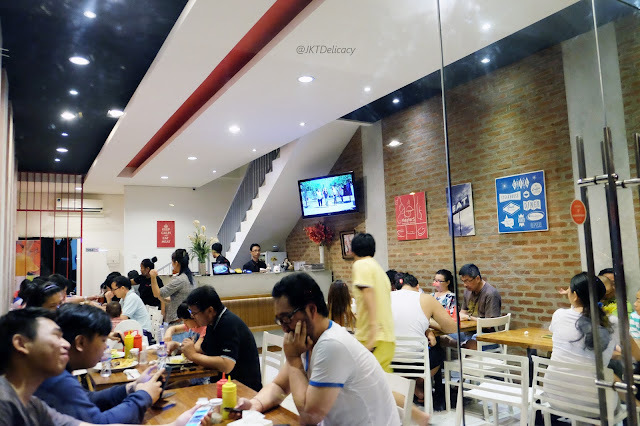 And there are indoor and ourdoor area which in total have around 11 tables each for up to 4 persons. If you go to the second floor, you'll find a dessert house called MATCHAFUKU which I'll review soon. 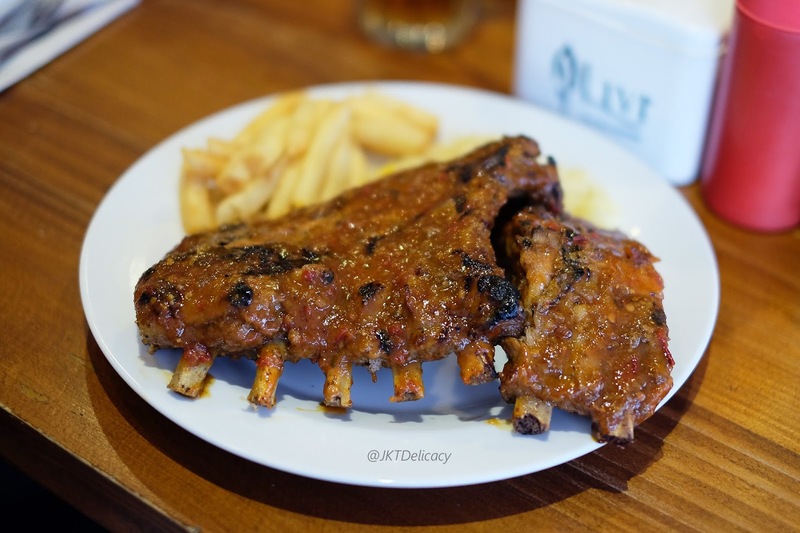 The first day I visited there, I straight away ordered the Red Hot Baby Back Ribs Full Rack for just IDR 132.000+. 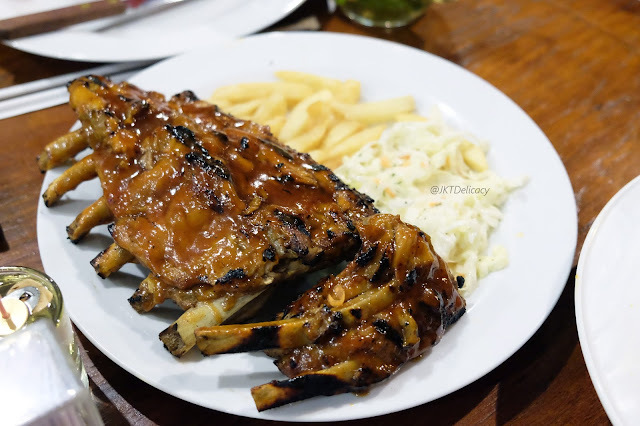 The full rack consists of 7 - 8 bones with 2 side dishes that you can choose, from French Fries, Mashed Potatoe, Coleslaw, Pasta Salad, House Salad, and Buttered Rice. 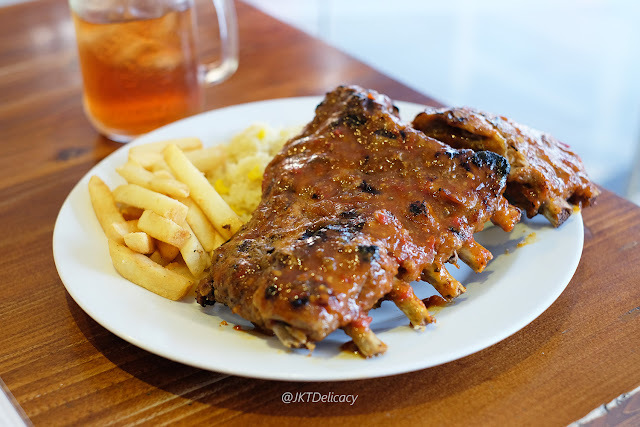 Meanwhile, the half rack consists 3 - 4 bones and 1 side dish for IDR 72.000+. You can add additional Side Dish for IDR 15.000+. When the ribs arrived into our table, we could smell some spicy flavors. I mean, it smells kind of Seafood thing like Belacan Sambal, but I'm not sure either. The meat itself was very tender and juicy, like it torn apart by itself. For me, it was an almost perfect Ribs BUT without the Red Hot sauce. I really don't recommend the sauce. The french fries and buttered rice were fine. 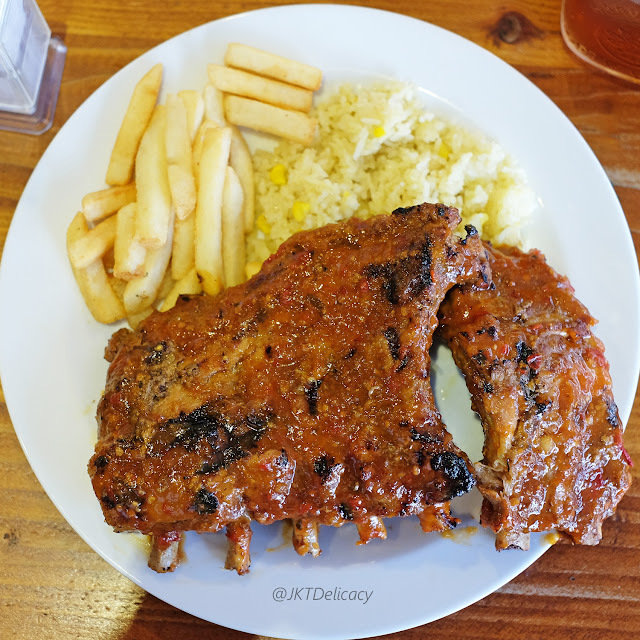 On the second day, I tried the Honey Baby Back Ribs full rack for IDR 140.000+. I was so satisfied this time considering the same Baby Back Ribs with a Honey sauce. It was sweet and went together perfectly with the meat. I super recommend this one. 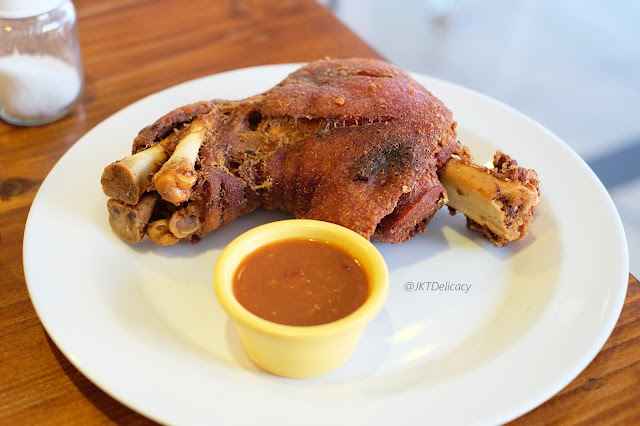 I never really knew what is Pork Knuckle until I tried it there. I mean I've tried it at Paulaner Grand Indonesia, but for certain reason I didn't quite like it. But for this one, I have to say it was sooo GOOD! 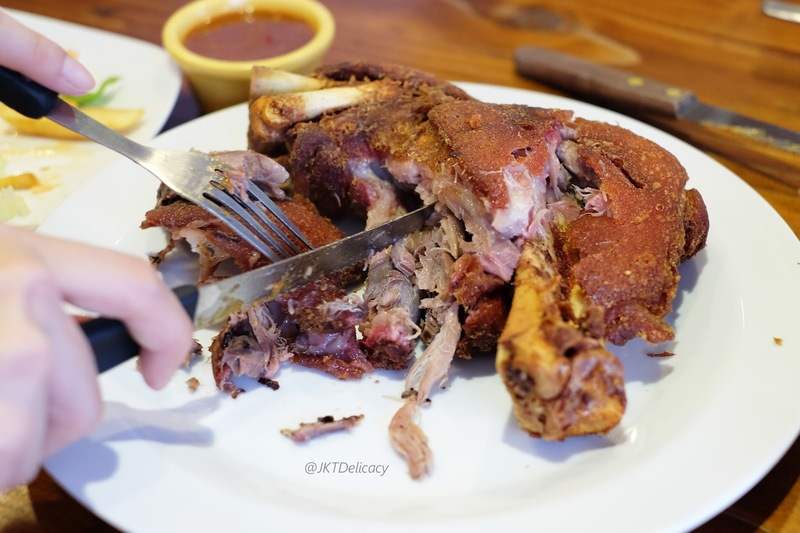 The meat was very tender, it has almost the same texture and flavour as Chicken Thigh. But, the nice one was the super crispy skin! It was thick and crunchy, but if you don't like Fat, then you might want to get rid of the fat first. The skin reminds me of Crispy Duck Skin i guess. 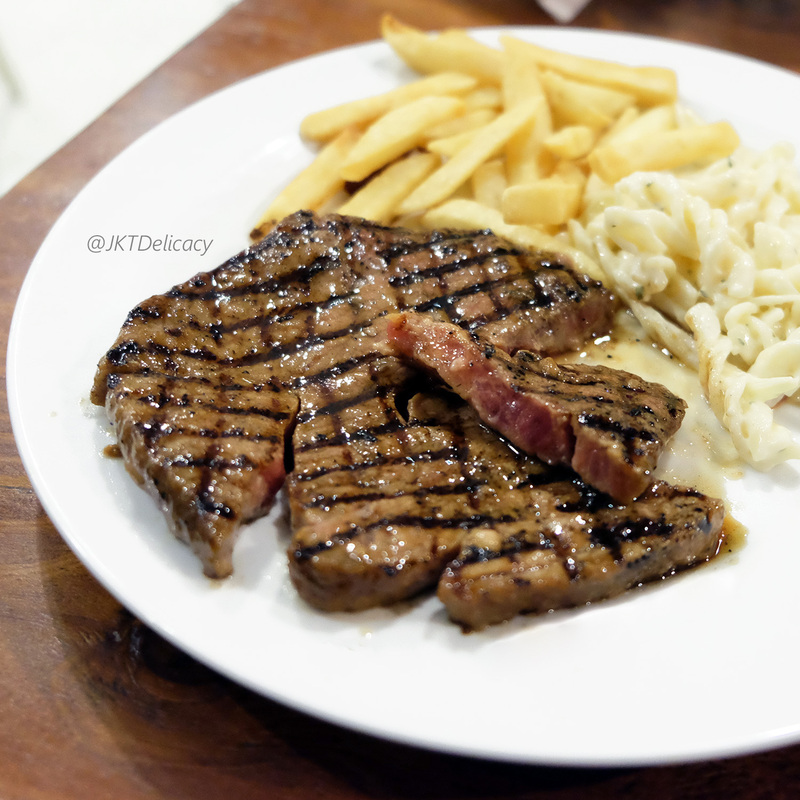 The Wagyu Special (IDR 82.000+) looks very appetizing! 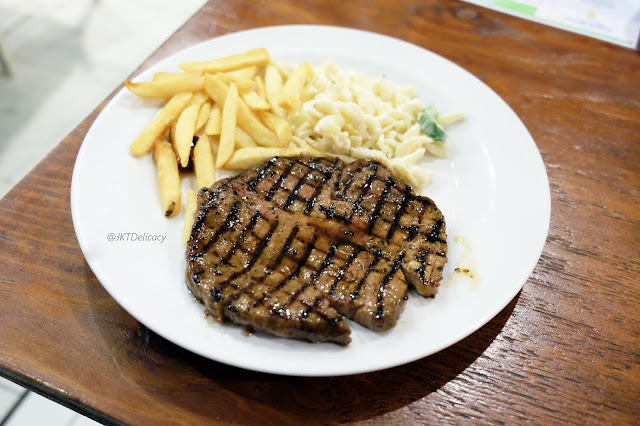 It was cut in perfect shape, and grilled in such a perfect grilled square lines as well. I requested for the Medium cooked and It came just as I wanted, Pink on the inside. 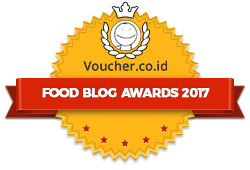 It comes with your choice of sauce which I picked Mushroom sauce. First of all, the meat was super smooth and juicy like you didn't need knife to cut the meat. However, I found something weird to the meat texture. When I pulled the meat with my fork, it just torn like very easy. When I had my first bite, In my mouth I was feeling like chewing some meat fat or some jelly desserts. Like it was too soft to be called a "Meat". The mushroom sauce was also too liquid and wasn't even tasted like Mushroom. 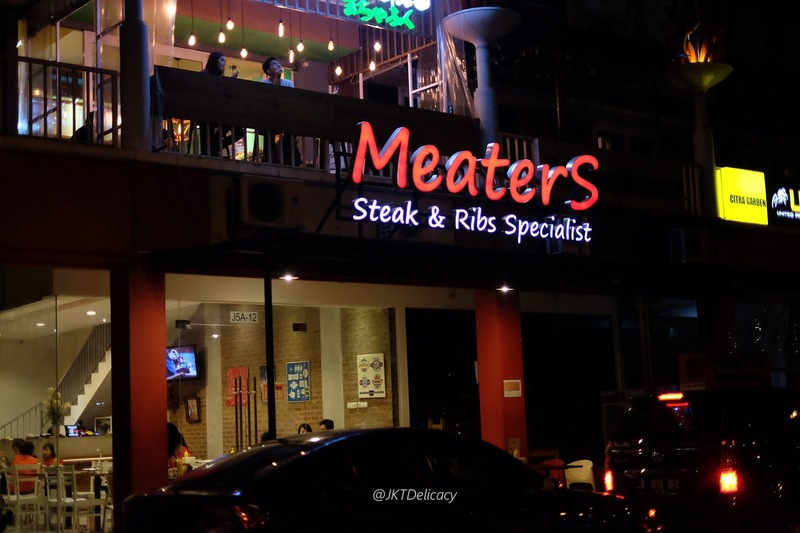 So, I don't recommend the Wagyu and the Mushroom sauce. 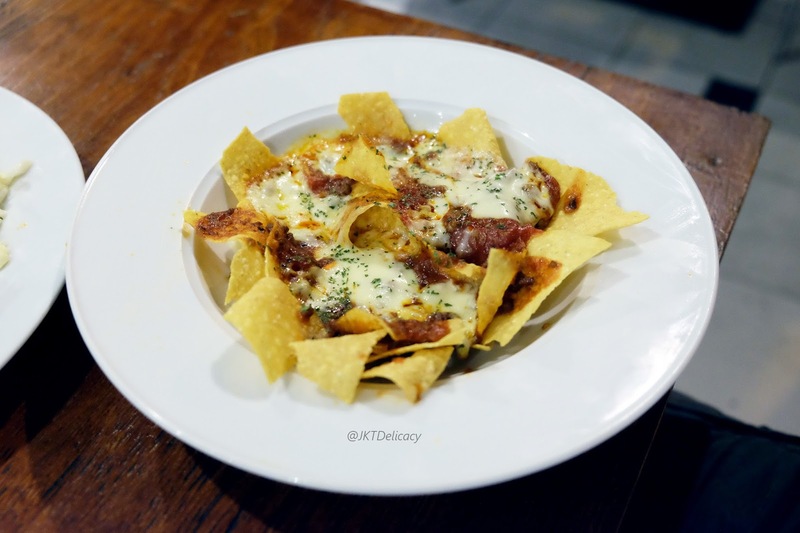 This Nachos is part of the appetizer menus. For only IDR 30.000+, it wasn't bad at all. 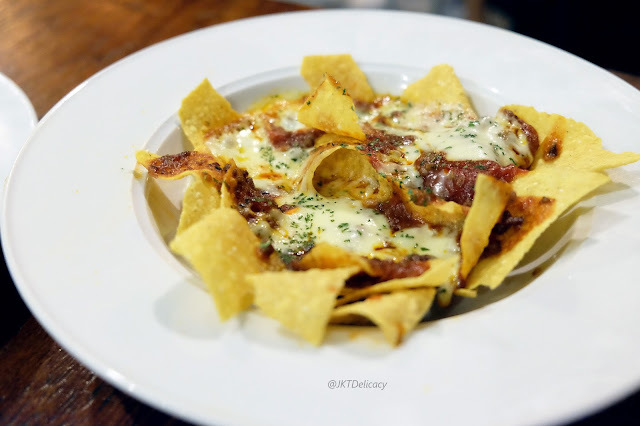 It was a typical crispy nachos with some tomato sauce and cheese melted together. 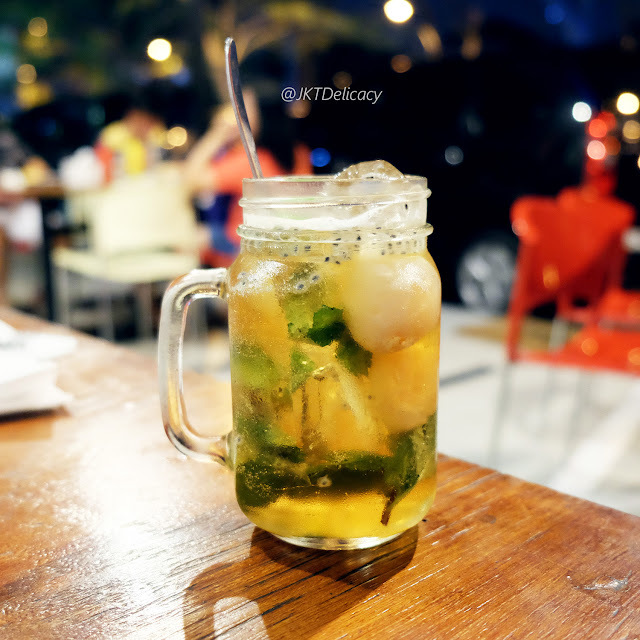 This one is Lychee Iced Tea with mint leaves for only IDR 17.000+ . Not bad :) You can also order their Iced / Hot Tea Free Refill for only IDR 6.000+! So, if you are interested to visit there, I suggest you to try their Honey Baby Back Ribs. It was super good, especially for that price. The good news is you can order the famous Matchafuku Ice Cream desserts (which is located on the second floor) and have it on the first floor in the Meaters restaurant.